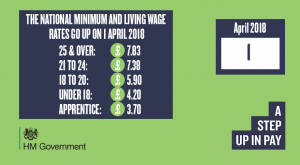 On the 1st April 2018, the government will be increasing the National Minimum Wage and the National Living Wage across all age sectors. The minimum wage rates affect more employers than ever and will have a significant impact on UK small businesses and micro businesses. 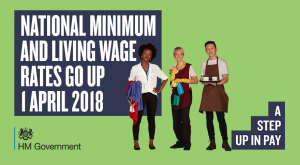 It is against the law for employers not to pay the correct National Minimum Wage or National Living Wage rate so it is critical for businesses and employers to be aware of these changes. If you discover you have been paying your workers below the correct minimum wage, you must pay any arrears immediately. The two younger age sectors, which are 18-20 and 21-24-year-olds, will be affected the most with the highest increases seen in ten years. Current rates for 25 years and over is £7.50. Will increase to £7.83 in April 2018. Current rates for 21-24 years is £7.05. Will increase to £7.38 in April 2018. Current rates for 18 – 20 years is £5.60. Will increase to £5.90 in April 2018. Current rates for under 18 years is £4.05. Will increase to £4.20 in April 2018. Current rates for an apprentice is £3.50. Will increase to £3.70 in April 2018. On Twitter and Facebook, you can keep up to date using the hashtag #checkyourpay.